Numeric Keypad on laptop keyboard. Num Lock and keypad keys are highlighted. On this keyboard "Num Lk" is main. It's possible that "Scr Lk" is main on yours. If so - simultaneously press ["Scr Lk" and "FN"] for "Num Lock". Note that this guide is for laptops, because usually they don't have a distinct Num Pad. If you're running a personal computer - read PC alt codes. Laptops ("notebooks") have a Function key ("FN"). It usually has a blue color. Find it cause we may need to use it later. Numeric Alt codes for symbols are listed in Alt codes list. Check for Alt code of symbol you want to input. You may need to simultaneously press ["FN" and "Scr Lk"] keys. That's the combination for "Num Lock" on some laptops. Look at the picture - the "Num Lk"/"Scr Lk" button is highlighted there. Some laptops require you to hold both "Alt" and "FN" keys. Input Alt code of symbol on Keypad. Do this while holding "Alt" button pressed. Type Alt code on your laptop's numeric keypad. It's highlighted on the picture. After you release all the keys alt symbol should be entered. If all this stuff didn't work - check if you have really enabled the "Num Lock" first. Remember that green indicator should shine near the lock symbol on your laptop's keyboard. If that wasn't the case - try simultaneously holding "FN" and "Alt" keys instead of just "Alt". That just might work. Certain laptop keys can act as numeric keypad. 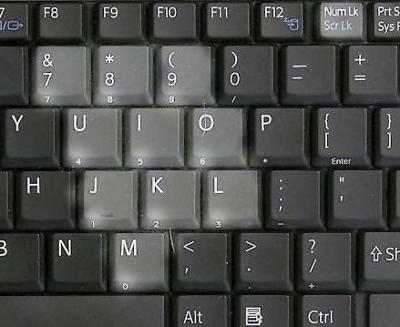 Look at photo to see what keys I'm talking about. I highlighted ones that create numeric part of keypad. You can see numbers on them. If you enable "NumLk", those keys will act as keypad keys when you press the "FN" button. Keypad keys are "7", "8", "9", "u", "i", "o", "j", "k", "l" and "m" buttons. If on your laptop you can't find keys with tiny numbers - try them. For those of you that don't have Key Pad, try [FN] + [F11] it may open a calculator-like keypad. If you don't have both Num Lock or ScrLock hold the FN button down then Alt so you're holding both down then enter your alt code. Thank you for the information but my laptop doesn't have the "Num Lock" key, so I'm not sure whether I can do alt codes on my laptop. Every computer has a "Num Lock" button. It just might be ["FN" + "Scroll Lock"] combination on your laptop. Laptop manufacturers do this stuff to lower space of your laptop's keyboard. Just like that on some laptops (like the one on photo) you have to press ["FN" + "Num Lock"] combination to get "Scroll Lock". Thank you a lot! Here's a cool thing you might like aboqe Text Flip. If you really have a laptop, and it's not some "Apple", but a normal "Personal Computer", you do have it. Maybe they are just called "NumLk" and "ScrLk". It's so on nearly every laptop keyboard and I just thought it's obvious. But okay, I think I'll change that in the article. If you do have Mac - Text symbols on Mac was made for you. Sadly, the laptop that I have doesn't have "Num Lock" and "ScrLk" keys. I "Googled" it and apparently, the manufactures took away some keys that they found to be unnecessary to my model. So if anyone here has a dell inspron 1545, you're going to have to change some settings to make things work..
Is there an alt code for a check mark? No, but it's listed in my Cool text Symbols for Facebook ツ collection so you can just copy-paste it from there. I agree with the poster not having a "Num Lock". My DELL computer does not have a "Num Lock" nor a "Scroll Lock". It also does not have a numeric keypad like is illustrated in the picture. Just copy-paste Cool text Symbols for Facebook ツ then. Looks, like you won't be able to type alt codes.. I have an HP laptop, and I cannot figure out how to write the "ñ" other than by copy and pasting it. I can do most of the other symbols, but the higher number don't work. They send me back to the previous page I was at, but will NOT add the symbol. How can I fix this? The other symbols are fine, and I hold down the "FN" key + "Alt" + code and it works fine for the lower code numbers. I assume they send you back because your Num Lock isn't ON. And when you press 7 on key pad - it acts like "Home" button and stuff like this. That's why it sends you back. You should enable the "Num Lock" first. Also, remember that you have to type the leading zero only for numeric alt codes above 100. Otherwise the symbol may not be entered after you release all keys. I dont have any tiny numbers on my keyboard. Then try using those keypad keys on the photo, or if you use a Macbook - go here Text symbols on Mac. How can I download the symbols? Maybe you can just save this page. Right click + "Save page". ≈ You can find it and more signs like that in my: Cool text Symbols for Facebook ツ. Just copy text symbols and paste as text. I looked everywhere my laptop is a Dell Studio 15 and it dosen't have a num lock I looked everywhere! About the dell 1545 with no numeric keypad....If you add a USB keypad, will the Alt commands work with it? Yeah, definitely, I think. But are they worth buying a USB keypad.. :? How do you do a peace sign on the laptop? You just copy it from Cool text Symbols for Facebook ツ.
I'm trying to figure out how to square a number. Don't remember how to.. Refer to Cool text Symbols for Facebook ツ and Alt codes list. How can I type question mark on my laptop Acer Aspire 5741, when I press "Shift" + "?" question mark, "Ã‰" character appears. You'll have to change language ("Ctrl" + "Shift", or whatever) before you press "Shift" + "? ", or type it with alt code 63. I have an hp 9500 and I can not get the blue symbol keys off. Therefore my keys does not work the way I want. Try FN + blue keys to get them "Off". For those of you that don't have a num lock, try "Fn + F11" there may be a picture of a calc type keypad. Good luck. So I have tried to type infinite symbol. Which's alt code is 8734 in Word. It's good in there, but when I want to type it in notepad I get ▲ symbol also the "original" Alt+236 isn't working it gives "ý" character. I use an Acer aspire 5530 with AMD CPU. Can you explain me why this happens. I appended several lines for you here Short details on Alt codes. Read carefully and thanks for asking. Maybe you will find the symbol you were looking for in Cool text Symbols for Facebook ツ or HTML entity codes of Special Text characters and just copy-paste it. Hello i have a dell Inspiron 1545, but it ain't working and I don't understand.Should I get a new USB keyboard or reset the settings?If I change my settings, please, help me. What program should I go through. The answer is simple: it should work. View the video and try again. Be sure you've enabled the right stuff and try with FN. It should work, it's not about any settings. But, of course, entering it on a normal keyboard is easier.. So if you won't have any luck then, maybe, USB keyboard would be a good solution. 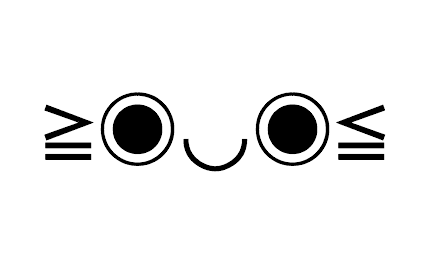 How can I put these symbols "ツღ✰" on msn messenger. Cause I have Windows 7 and my MSN doesn't let me paste these symbols on my name >:(. ..After a small MSN conversation with this girl I found out that it was really impossible to paste symbols because of Windows 7. =( I told her to try it from Windows XP on some of her friend's computer. How to make 1/3, 1/5, 1/7, etc. on laptop? Copy-paste from Cool text Symbols for Facebook ツ.
I use ibm ThinkPad. but when i hold Alt, i can't type any number(i am sure that i enable the Num lock) i also tried hold Fn+Alt, but still, i can't type any alt code. How to solve that? It's good if you don't type any numbers into input field. I'm sorry if I made the video a little bit confusing, but when you hold Alt key with the Num Lock turned ON, no numbers should be typed in when you hit them. Instead, after you've entered the code, the symbol should get typed. If it doesn't work for you, please, read the reference again. My bro's on ThinkPad too and it work well on his laptop. I have a keypad on my laptop. I did everything possible but the keypad codes still doesn't work..
Ss it possible to type a rainbow like u can type a heart ♥ and smileys ☺☻ and pretty much anything else and I wondered if its possible to type a rainbow? No, it's not yet possible. Sorry. I cannot make my notebook do alt codes. I already tried to use: left/right Alt key, type codes with/without proceeding 0, holding Fn + Alt together, hold Alt then numbers with NumLock on, and even Alt with alphanumeric digits - in all possible combinations. I also have sticky keys off (someone suggested that it may cause the trouble), yet I wasn't able to use codes. Is there something else that may make them not working? Don't know. I don't think so. I think you should try copy-pasting. If you will, take a look at Cool text Symbols for Facebook ツ too. I found answer to my question. Alt-keys won't work if you aren't using international keyboard. So, some regional keyboards (in my case Polish) don't allow you to use alt-keys. I think you can note it somewhere, it might be useful for someone. How do you do a robot face for typing to soneone like the one at the bottom of this page that says "type '43'"? It's a smiley in Facebook chat. Look at New Facebook emoticons & chat pictures. It isn't letting me use Alt+0246. When I do press it my page refreshes. Can you, please, tell me an alternate for it? Problematic.. Maybe, you should try another Alt key, or something. Cause I can type ö with 0246. I have a question. How are we going to write in Korean writing? Or French? I sometimes have symbols on the letter. I don't know how can it be like that, so, please, answer my question. You've got to have a Korean, or French language chosen in your OS (Windows, presumably) to do that easily. If you'll go to France, I assume you'll see French keyboards there. I just purchased a HP G42 Notebook PC & cant change the type setting back to question mark, from your answer, is there another suggestion? I didn't quite follow your problem, but what I understood is that you can't make for some reason. Lucky thing is that I recently found out about Shift states for Windows symbols. I think you should take a look. I also have a DELL INSPIRON yet I am unsure of the exact make. There is no keypad, no "Num Lock" nor "Scroll Lock", and no small numbers on the keys your picture denotes. I have read the previous comments and also found it impossible using the "Fn" and "Alt" keys with the 2 different codes to type special characters. One option is to copy-paste as said earlier and put special characters on your Sticky Notes(if using Windows 7) for convenience or look for "Character Map" in your computer and find the special Character you want and Either copy-paste it or drag it from the character map to the desired space. So, I opened up the Character map, and noticed that not all symbols have keystrokes(alt+numeric combination). How do you use the other symbols? For example, black smiley face on mine has no keystroke, but it does say U+263B , how do I use it? You can type all symbols with Shift states for Windows symbols.